We have been reviewing Battstone’s releases since 2014, and gladly! This guy is so prolific, it’s a pleasure to receive his latest efforts. There are many styles of jazz and each jazz musician gravitates towards their own style. In general, though, no matter what style a player prefers, they are usually separated by “inside players” or “outside” players. Most artists that live in the musical world of straight ahead swing, bebop, post-bop, dixieland or fusion don’t usually play free or in the avant-garde genre (outside). There are some musicians however that thrive in both the inside and the outside world, and that is exactly what have we here with Pat Battstone and Antonella Chionna. This dynamic duo released The Voice of Robert Desnos after performing together in groups and duets, the two realized what a cohesive duo they created together. The chemistry between Battstones’ piano and Chionna’s speaking and singing is something special and the freedom of not having the traditional drums and bass, adds to the duets freedom. The dynamic duo (yeah, I like that phrase) presents eleven tracks based on the poetry of Robert Desnos and one standard, all in a free-spirited improvisational style. Chionna’s delivery on the opening track, “If You Only Knew,” is exceptional. Her emotion and passion while delivering the words of the poem is brilliant. Battstone’s improvised performance matches Chionna; the piece develops into a musical statement that may be improvised totally in the moment, but has a flow that is easily followed. Much of the time Battstone’s playing is very “inside,” but when Chionna’s words or delivery call for it, he can easily venture outside to create impressionistic sounds colors and effects. This is avant-garde that is accessible by any music lover, the continuity of the music could very much be a contemporary, fully composed classical piece, that is the level of continuity flowing through the instant. On “Wifeless, Plump Buck Moonigan,” Chionna delves into the avant-garde on her own. She accompanies her reading of the poem with her singing. Sometimes she holds long notes, sometimes she will slowly ascend or descend into a note or move between notes in a slow glissando. The result is very interesting and although not “inside,” the combination of singing and speaking is effective in its artistic presentation. Battstone’s playing can be either melodic or abstract, depending on what strikes his fancy at a given moment, but even the more avant-garde moments of his playing should be thought of as mildly avant-garde, rather than radically avant-garde. Battstone’s control of harmonic color and sound effects on the piano are always in context and musically sound. His playing is very “inside” really, he just has the ability to go “outside” to bring in fresh musical colors and rhythms. The title track is a good example of his color control. Battstone’s use wide interval chords and colorful melodic figures to move the music forward is cornerstone. Even when he hits the piano for a percussive effect, he does so holding down a chord so that it maintains harmonic relevance with in the piece. The same is true when he strums the strings inside the piano, the sounds produced always relate to the harmony and flow that have been created with in the piece. The Voice of Robert Desnos is a creative, reflective, good-natured avant-garde offering that is completely musical and fresh, and is totally balanced in its “inside” and “outside” moments. The reading of the poetry and playing and singing are always congenial and accessible. On the other hand, the inside/outside dynamic is an important part of the album’s appeal coupled with the friendly dialogue that Battstone and Chionna enjoy, which yields satisfying results on every track. 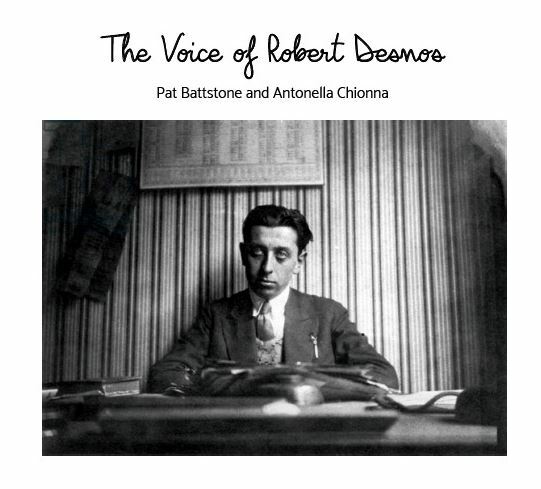 Be the first to comment on "Pat Battstone and Antonella Chionna | The Voice of Robert Desnos"